We are proud of our industry-leading health, safety, environmental protection and quality policies and procedures. Our stringent control systems are specifically designed for complex industrial construction, maintenance and shutdowns projects and have been tested in some of the most challenging environments in the industry. We provide you with safe industrial construction services. We are proactive: the Health, Safety and Environmental Program’s primary objective is to mitigate the risks by eliminating at the very source dangers regarding health and safety on our job sites. We have developed a detailed and comprehensive HSE reporting system to capture all leading and lagging indicators to benchmark our performance and guide us towards continuous improvements. We constantly improve: our HSE Program is continuously evaluated and improved in order to maintain optimized and efficient policies and procedures. Those policies and procedures are monitored, communicated through information sessions, toolbox meetings, formal and informal training, etc., and audited on a regular basis. We make sure that all our workers on construction sites have all the required training and skills to safely and efficiently carry out their tasks. An illustration of our commitment is our Annual Best Practices symposium to ensure our workers are equipped with the best knowledge and training to excel in safety. 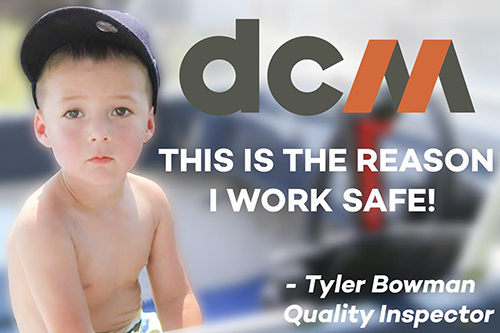 We are all responsible: DCM makes health and safety our core value; the owners, the management, the site supervisors, the safety team and all of our employees take personal responsibility for the application of the HSE Program. The Health and safety accountability applies to all levels of the organization. We apply rigorous environmental management practices and respect all environmental regulations. For each project we undertake, we establish clear measures to identify risks and mitigate them. Our teams are trained to promptly address any environmental incident and minimize potential impact. To achieve these objectives, we rely on the commitment of all of our supervisors and on the accountability of each employee. We strongly believe in doing business in a manner that promotes environmental interest at all times. We adhere to the highest quality standards. Our ISO 9001:2015 registered quality assurance program ensures that all work performed exceeds client expectation. The program encompasses all important aspects of quality management: rigorous work planning and monitoring, stringent inspections & testing, comprehensive change management, and structured documentation management. We do it right: Our focus is getting things right the first time! We believe there may be several ways to manage quality, but that ultimately there is only one way to achieve quality work: ensuring that the work is planned and managed so that it can be executed in strict compliance with industry standards and all clients’ requirements, whether those are expressed or implied. We have a wide array of tools available to help meet these requirements. We integrate our quality management process within construction activities: The Inspection and Testing activities detailed in our quality program are identified in our work-face planning activities so that these quality control activities can be performed efficiently, in conjunction with our construction or maintenance tasks. We are relentless in our documentations: DCM is proud to offer clients thorough and comprehensive documentation demonstrating compliance of the work performed. The documentation process starts with a structured internal documentation center accessible to all employees on our intranet. An operations manual has also been developed to allow employees to easily navigate through the quality system and find the tools they need to properly conduct their tasks. Our quality management system also comprises guides on how to efficiently collect documents throughout the duration and at the end of the project, ensuring the turn-over packages are complete and respect contractual requirements. We believe quality is a team sport: our clients are not only involved in approving Inspection & Test Plans; they are also encouraged to add their specific requirements and hold points. We involve our sub-contractors in our quality management protocols, ensuring they too meet the highest standards. While our quality policies and processes are developed at the senior management level, they are implemented by all levels of management and embraced as values by all employees. Quality is an important part of the culture at DCM. DCM achieved a 99% compliance score on the renewal of their ASME Quality Control Manual with the Regulatory Authority ABSA (Alberta Boilers Safety Association). At DCM, we make your priorities our own. Our project management principles ensure that you get a quality product on time and on budget. Our integrated project control system seamlessly merges estimation, work-face planning, scheduling, and quality assurance with the feedback loop of tracking. We are always in a position to provide you with up to date data. We boast a comprehensive suite of business system tools such as DTC for the time management, various progress and quality tracking databases (piping, electrical and instrumentation), Primavera for managing the project schedule, Maestro for accounting and purchasing, as well as an integrated database to manage Field Instruction Work Packages (FIWP) used by the Construction Execution Teams. We generate regular project reporting detailing all project KPIs including HSE, quality, progress, productivity, commercial information, engineering status as well as identification of any key events or impacts to address.